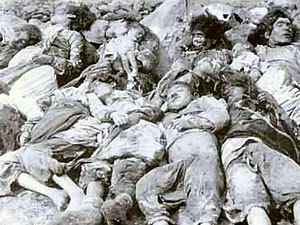 Turkey still denies responsiblity for its mass murder of Armenians. The world would know little about it but for Franz Werfel’s vital – and largely forgotten – novel, The Forty Days of Musa Dagh. Many Mahler buffs like to demonize Alma, but she pulled a lot of strings and used her own funds to get Franz Werfel out of Europe and on to safety. This, in spite of the fact that she frequently drank too much and liked to say nasty antisemitic nonsense to Werfel – a true case of ‘actions speak louder than words’. In Claire Goll’s memoirs, she tells how Werfel asked her advice about the vexed question whether he should marry Alma Mahler or not, about which he was very anxious, and did not know what to do. According to Claire, Alma bullied Franz to write master pieces, locking him up in his room to write, and squeezing him to death, emotionally, psychologically. Maybe even physically. Strauss’s wife (Pauline) was also good at ensuring he worked hard. These parterships are of great importance in this respect. I believe she also terminated a pregnancy from her torrid affair with the expressionist painter/artist, Oscar Kokoschka. That would have been sometime before her Werfel pregnancy. Some claim that Kokoschka was the true love of her life, but I think it’s difficult to prove such a claim. It certainly was ‘hot and heavy’. She did have a daughter by Walter Gropius, Manon, but she died as a teenager. Alban Berg wrote his incredible violin concerto as an elegy for Manon. Composers’ wives who want to make sure their husbands ‘work hard’ have no idea what the creative process is. It is Pauline’s fault that we have so much Strauss music which consists merely of busy note spinning and hollow gestures, entirely uninspired, and you can imagine him scribbling away, bored but a bit anxious lest Pauline thinks he is not working hard enough. Pauline, daughter of a general, wanted to be the wife of a successful, hardworking and especially rich composer. Strauss also had regularly to interrupt his work on the Elektra score because he had to walk to the village for milk. So, for example, when he was putting the touches on Elektra’s hysterical outbursts, Pauline would silently place a couple of empty bottles on his desk. Debussy’s wives got crazy – apart from living with such person – from his long periods of staring into nothingness ‘instead of doing some real work’, not understanding that work is not only physical movement that can be noticed by the environment. I don’t come to SD to see pictures like this. They will be showing the Irish famine next and 17th Century Cromwell massacres next, Ah, perfidious Albion yet again. How very sad for you. I recommend classical music. It was a quote from the Nestor section of Ulysses, do you ever read any Joyce? The U.S. government does not recognize it as a genocide, not because of any similar atrocities we may have committed (notably against Native Americans), but for pragmatic political reasons: We don’t want to jeopardize the status of military bases in Turkey. I do sort of take issue with Norman’s assertion that the world would know little of the genocide without this book, though; it was written in 1933, 15 years later. There were plenty of contemporaneous accounts, including by U.S. Ambassador Robert Morgenthau. Though I wouldn’t dispute that it helped bring renewed attention. Multiple means were used, apparently including toxic gasses. The Turkish government doesn’t want you to see photos like this either. That’s something of an exaggeration. The UK and US governments do not deny that the Armenian genocide took place. Rather, they refuse to recognise that it was a genocide. They do not deny that the events depicted in the photograph took place and nor do they seek to suppress any such evidence. What they do refuse to do is to recognise the evidence as proof that a genocide took place. I believe that the UK and US governments are wrong to refuse to recognise the genocide, but let’s not exaggerate and claim that they would like to suppress evidence that some form of mass killing took place. Would I be correct in guessing from your name that you are Irish? If so, it seems odd to single out the UK and the US, as Ireland, too, has so far failed to recognise the Armenian genocide. Indeed, the genocide has received even less recognition in Ireland than it has in the UK, where the genocide is recognised by three countries within the Union. I think we owe Alma an awful lot. We are fortunate she lived so long that she was able to talk about Gustav. Research has shown that much of Alma’s ‘information’ about Mahler was not true. Apparently he was always on the phone to god! Poor St Peter. The late great raconteur Dave Allen, knew all about contact with god. Indeed he was the best raconteur of the 20th Century. This sketch is a classic, note the added use of classical music (Chopin’s funeral march) which adds to the dramatic effect. Yes, but her emotions were true. She tended to exaggerate or ‘bend’ the truth in order to make things fit her own personal narrative. How many of us don’t stoop to that from time to time? I believe alcohol took a big toll on her, both physically and otherwise. It’s not uncommon. Truth is there to be bent to one’s personal narrative – where else is it good for? Abstract truth is meaningless! And I’m sure this is true! Who’s Sally? (not that it’s any of my business). I keep that Tom Lehrer cd at the start of my Mahler collection. I’ve read The 40 Days of Musa Dagh by Franz Werfel. It’s a phenomenal book, and it has stayed with me even as I read it a long time ago (in the 1980s). While it’s fiction (but based on a true story), an even better book that anyone interested in the Armenian Genocide should read is Armenian Golgotha, the autobiography of (Father) Grigoris Balakian. Father Balakian was one of the few Armenian leaders and intellectuals who was arrested in Constantinople/Istanbul on April 24, 1915 and sent to the interior for execution, yet managed to escape and survive. His story is nothing short of astonishing. But his memoirs go significantly beyond the Armenian genocide, and he shares a lifetime’s worth of insights, wisdom, and understandings that are spread throughout the narrative, which would be of particular interest to anyone seeking to understand the world we live in, self-help type issues, and how to live a better life. The narrative is unbelievably rich, while also providing an unusual vantage point to someone who (barely) survived the Armenian Genocide. I can’t recommend it enough. And I didn’t know the Alma Mahler angle here, so thank you Norman for sharing that. And thanks of course to Alma. Thanks for the heads up. Sounds excellent. His son was Ahmet Ertegun who founded Atlantic Records with Herb Abrahamson. No decent human “likes” to see such pictures. However, they help us not to forget, which is a very good thing, because remembering the past is essential for understanding the present and for preparing for the future. That is why young people in universities behave as they do. A deliberate effort not to Teach European history is finding its consequences. Most of these warriors were exercising their white privilege. We live in ugly times. The barbarians are amongst us now. Oh, I do get a little tired of those “wimmin” exercising their “female privilege”……………. It would be naive and foolish to think that Turkey is the only country overlooking genocide. Victors never declare their genocides and create histories that erase them. The mass murder of the Mayan population during the 1980s in Guatemala is an example. During the civil war, the government’s army, trained and funded by the USA, destroyed 626 villages, killed or “disappeared” more than 200,000 people and displaced an additional 1.5 million, while more than 150,000 were driven to seek refuge in Mexico. So many farms were overgrown after the deaths that even the satellite images of the country were massively changed and stand as evidence of the genocide. Ronald Reagan’s administration was the principle architect of this genocide. And yet we have named the airport in our nation’s capital after him. Perhaps appropriately…. There are almost always clear indications when societies are moving toward genocide. We choose to ignore them. In the West, we are especially inclined to ignore the genocidal nature of embargos. So now let’s all call be the pots calling the kettle black…. I forgot to include Peter Balakian’s “Blag Dog of Fate” (2009). It’s “Black Dog of Fate,” not “Blag…”.